This weekend saw me at two markets - the Luna Markets on the riverbank in Rockhampton and the annual Rotray Club Biloela Art and Craft Fair. It was a busy weekend but I had lots of fun. 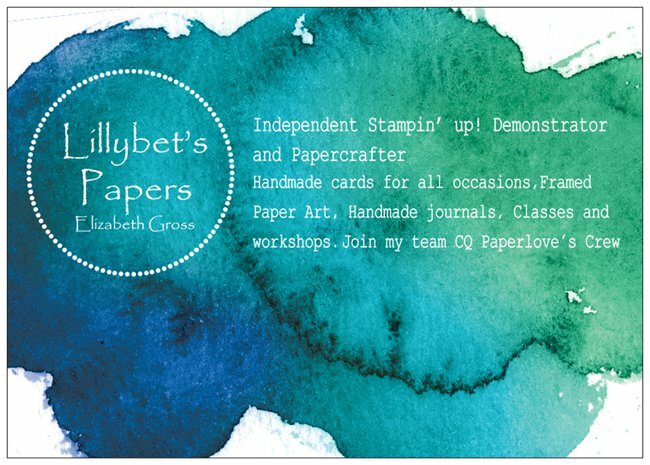 Thankyou to all the new people who stopped by and checked out my stall. 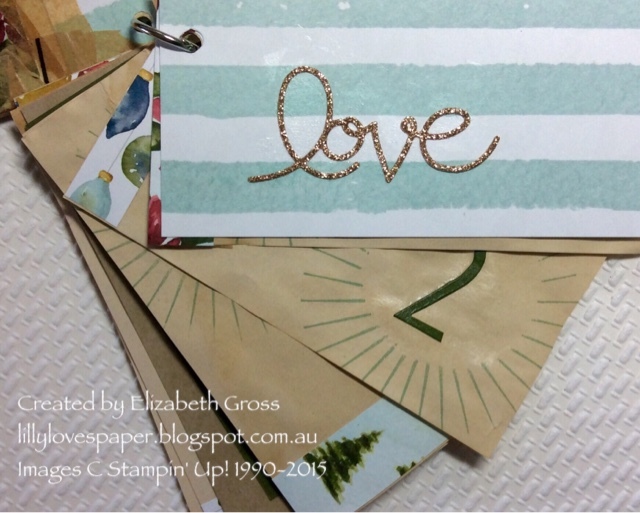 "Don't post online- put some real paper in the post" "Snail mail is so nice to receive"
Since it is leading up to Christmas I had lots of gift packs -for 3x3 cards, notecards and larger cards as well as plenty of art journals. Kraft flap cut 6 x 4, score at (landscape) 3 and 3 3/4 or 3 1/2 depending on how bulky the cards are. On Rachel's photo tutorial she scores it at 1 7/8" and then folds this in, and then brings the other side in to meet the fold in the middle, and landscape she scores at 5/5/8" from each end. 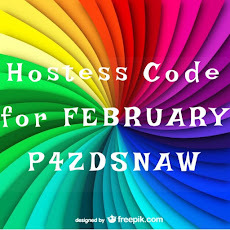 I love fresh flowers, I love giving flowers and I love having fresh flowers at home, but sending them can be problematic. 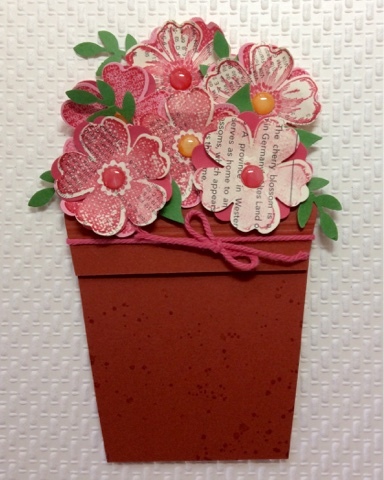 A solution - send a flower pot card! The lucky recipient is sure to smile. 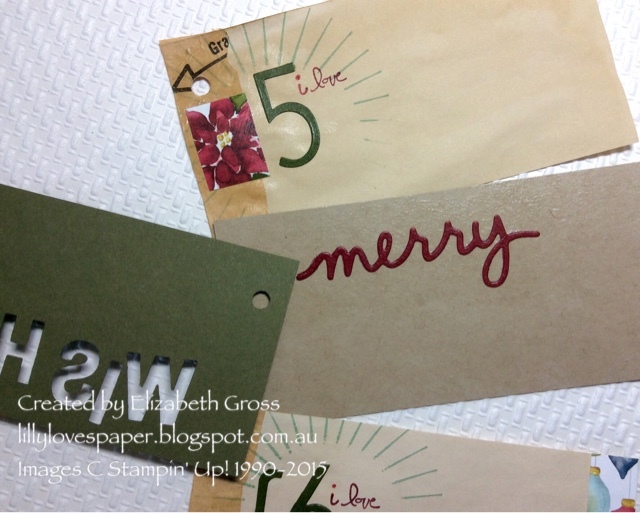 These cute little cards fit in a regular envelope and have a strip of magnetic tape on the back so they could be put on the fridge. 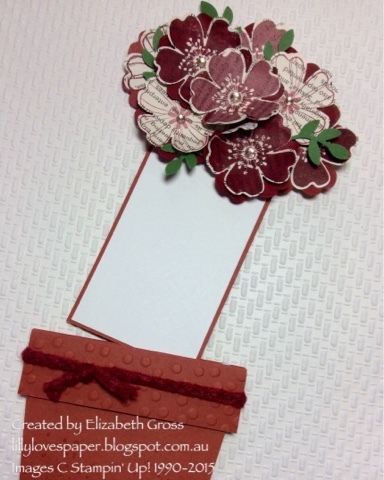 The panel with the flowers slides out for your message. 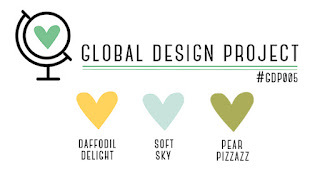 The possibilities are endless for colour combinations and flowers. 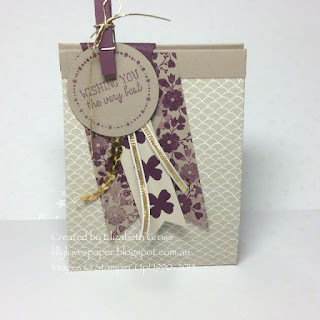 I have used Flower Shop and the coordinating pansy punch, and a variety of papers and colours. These are a few samples. 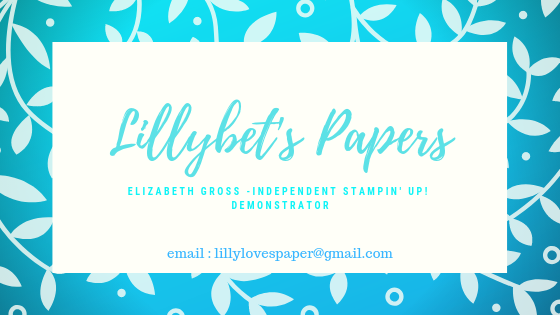 I'll have lots of these cards at the markets this weekend in Biloela, as well as the Luna Markets in Rockhampton Friday Night. 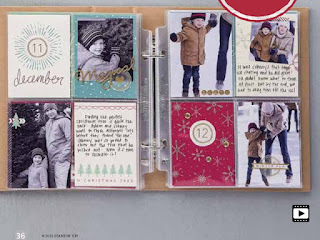 CASEing the Catty #52 - 10 things I LOVE about Christmas mini - card with a difference, it's a mini album !! Welcome to the Bloghop for this week. 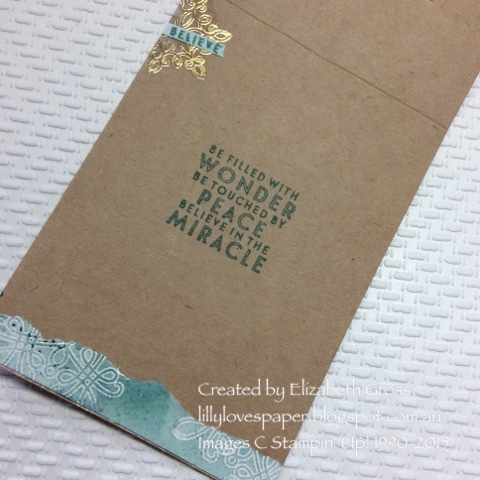 We are Casing items using Project Life but I seem to have gone off on a bit of a tangent ..... oh well, it's something different for me so that's a good challenge! 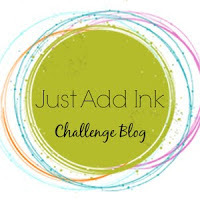 You may have arrived from the talented Julia Quinn's blog or you may be starting here. 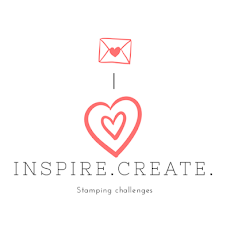 We hope you find something to inspire you along the way. 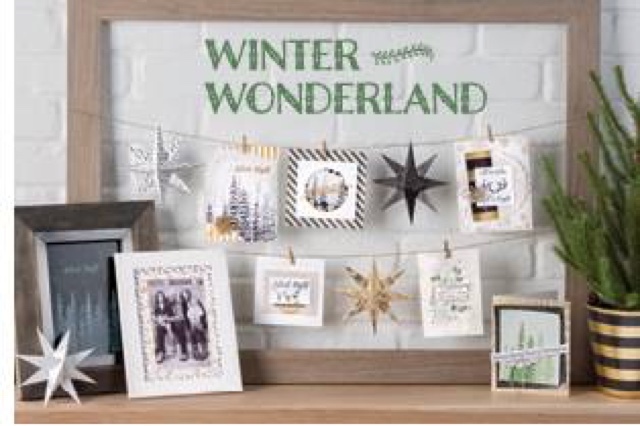 Be sure and stop to check everyone's projects inspired by the Project Life Christmas range. 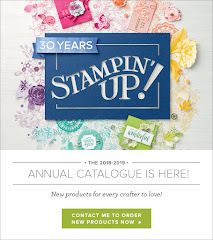 There are lots of great products in this range which can be used for both scrapbooking and for card making. 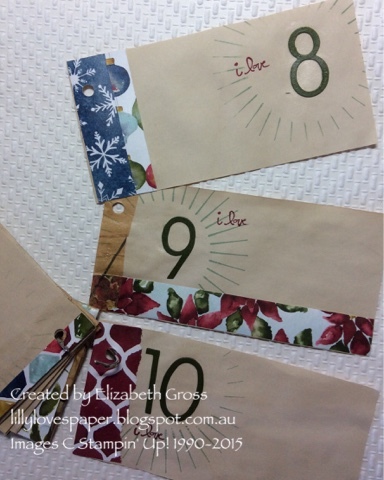 - with the numbers in the sparkling circles, and the idea of journalling a Christmas countdown. So I have made a card with a difference - a mini album to journal Christmas memories, Christmas traditions, recipes,gifts, carols, games etc. 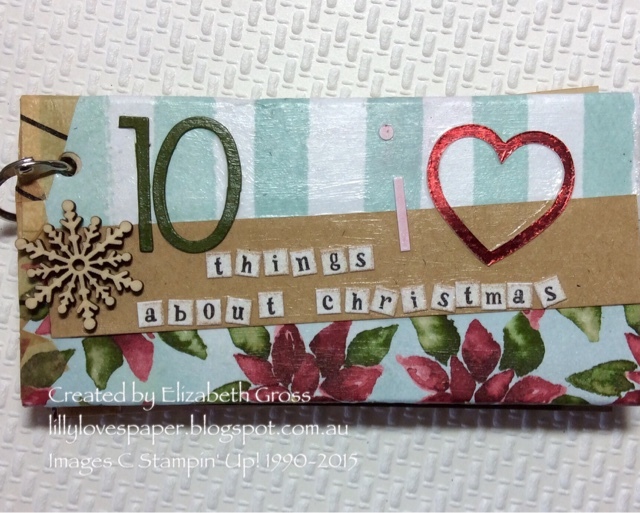 It is titled "10 things I love about christmas"
The first page, with the jump ring closed and the pages fanned out. I have opened up the book and photographed groups of individual pages so you get the idea. 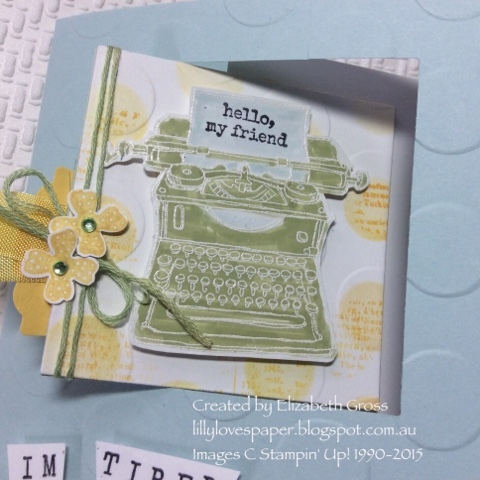 Each page is numbered and says "i love", and has the Radial stamp from Kinda Eclectic in Mint Macarron. 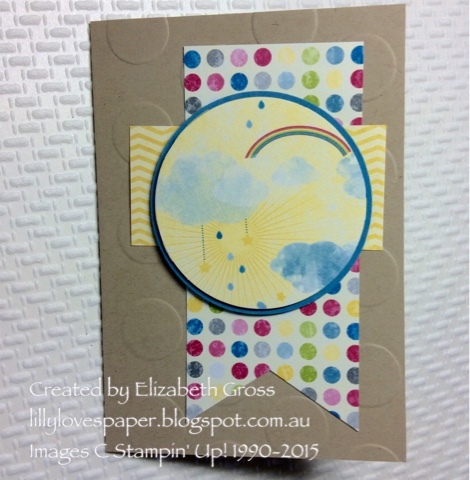 ( I masked the centre with a circle of card to give me space for the numbers). 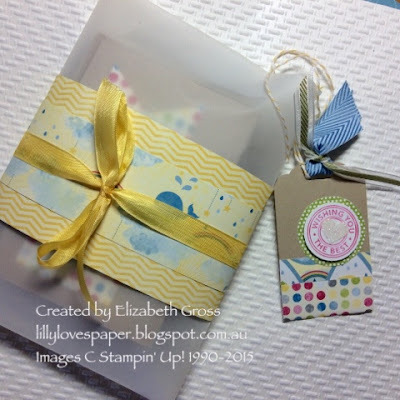 All the pages are slightly different and have been decorated with scrap strips of DSP. 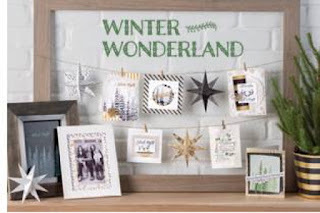 It can easily be personalised by adding in photographs or other personal Christmas memorabilia. 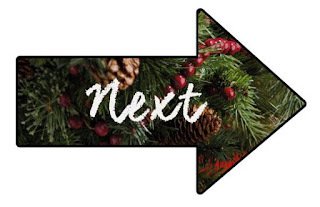 Turn the Mossy Meadow WISH page and you'll be surprised with what's next. 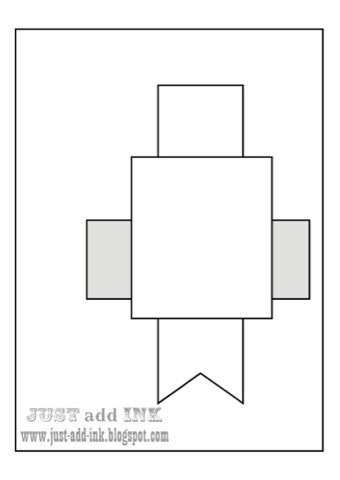 It's a different take on a Chritmas card but could easily be posted as it's small enough to fit in a regular D6 envelop. 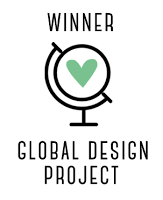 I love the challenges at the Global Design Project and all the samples the design team create- it truly is a star studded crew of amazing designers from all over the globe. This week I am determined to be ready earlier than the 11th hour. 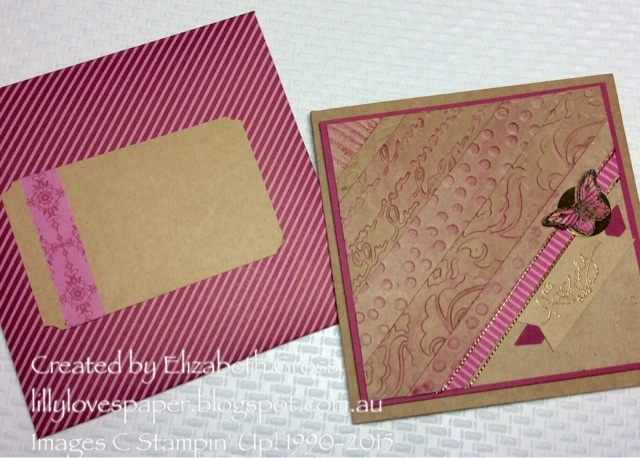 As soon as I saw the sketch I knew exactly what I wanted to recreate- modelled on a swap I did for Convention a few years ago - and since I am preparing for two coming craft fair markets it will go into my stash of square cards with coordinating envelopes (love my Envelope Punch Board) - sort of becoming my craft fair signature item. 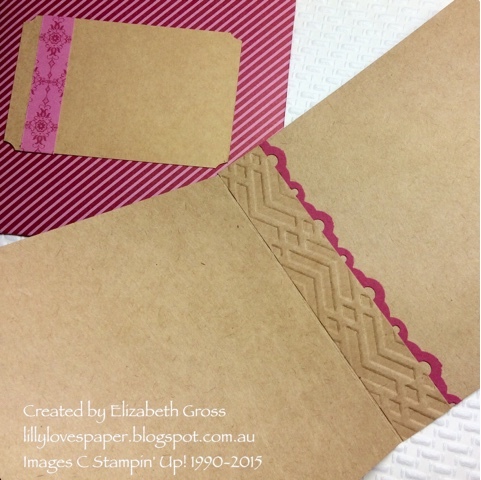 While not quick to create, this design is a great way to use up scraps- which is good if you struggle to throw out all your leftovers. 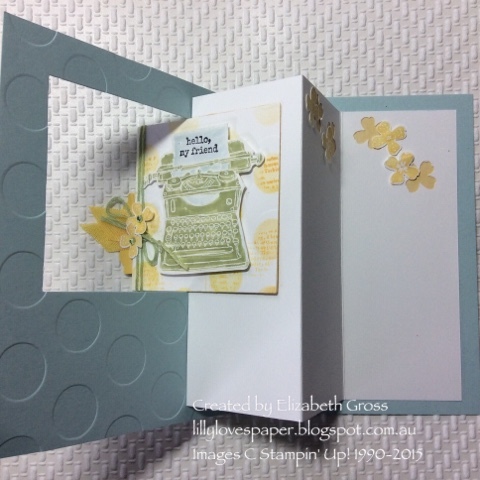 The layers of different embossing folders and the random width of the strips is completely arbitrary so every card will look different. You can lightly sponge the surface, like I have done here, or leave it plain. 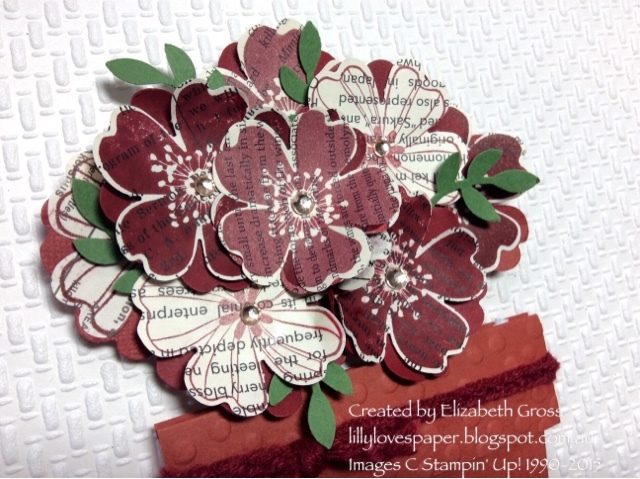 I have used Rose Red DSP and Kraft Cardstock and some of the new fine Gold Cord which is wonderful. The little circle of gold foil behind the butterfly caught the light in the photo but it's relatively subtle in reality. 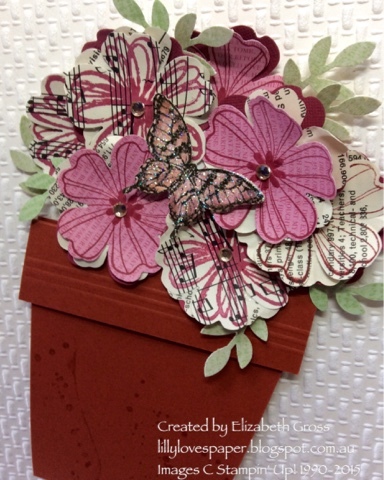 The little butterfly from Papillon Potpourri is heat embossed in Early Espresso and coloured with the blender pen. 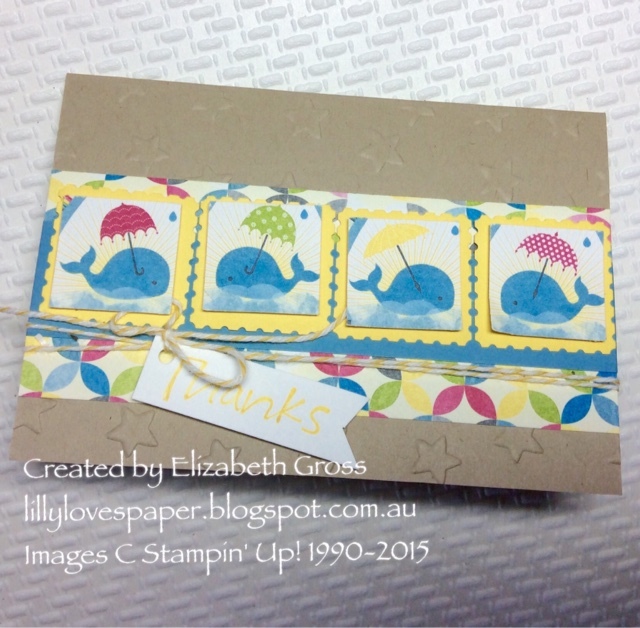 A quick little set of thankyou notecards using the gorgeous Sunshine and Sprinkles paper which is on the Clearance rack at the moment. 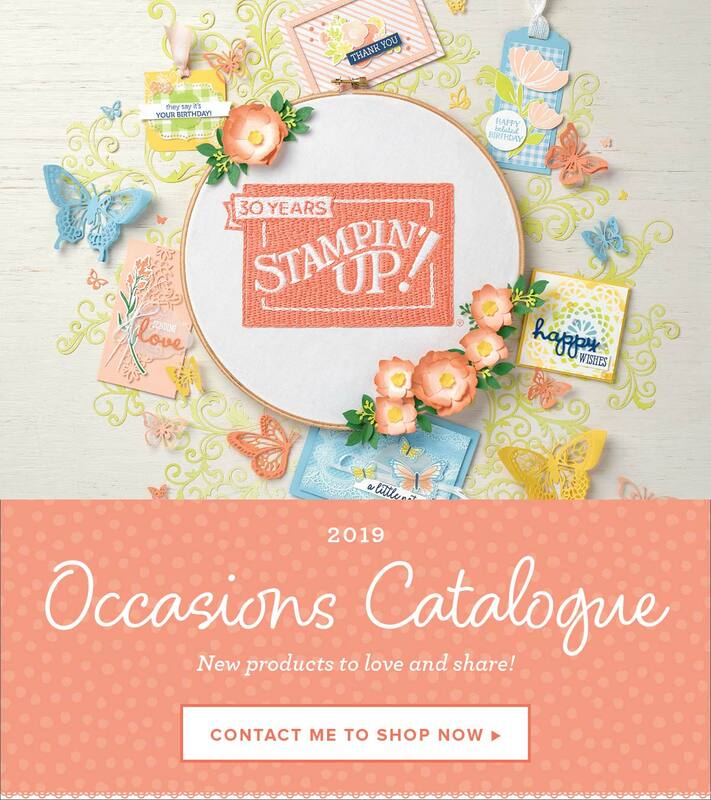 Its's great value and if you would like a set for yourself please get in touch - or you can order it yourself online using the Shop Now button on the right of this page. 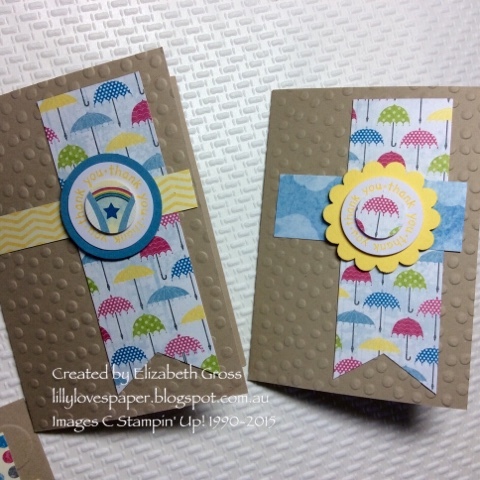 I used the fabulous easy sketch from JAI#283 and these came together in no time. 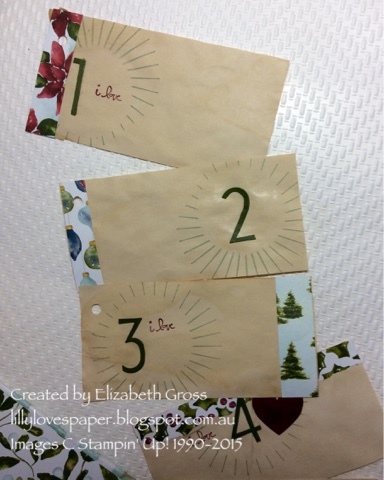 There's 2 of each and they are packaged up in a vellum envelope wrapped in more gorgeous Paper. 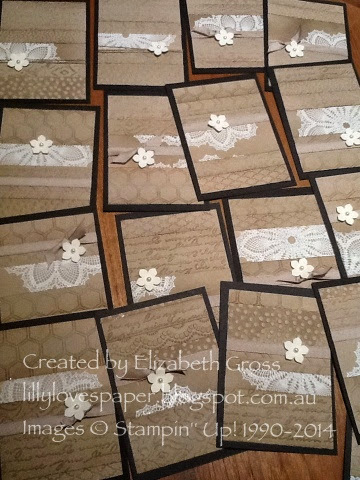 I used the Crumb Cake Notecards and Envelopes which are also great value and work out to about 50c for the card and envelope. 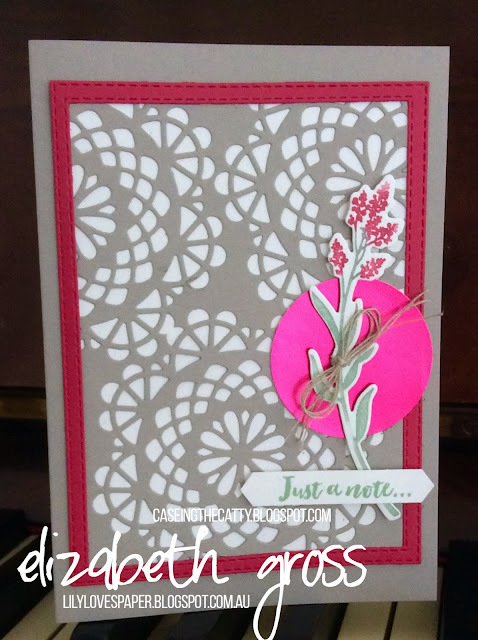 I embossed each of the card fronts for a little extra detail. 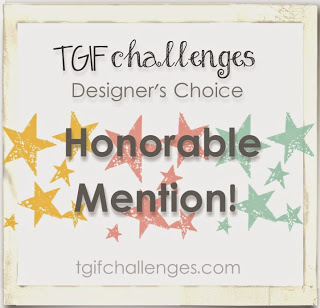 Welcome back to the CTCbloghop where we all create projects inspired by the amazing samples in the Catalogue. It always amazes me how we all study the same pages and we can each see something different. I also find that going back to previous catalogues is a great way to find ideas. You may have arrived from Rachel's wonderful page or you may be starting here. 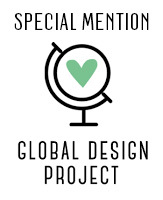 We hope you find something to get you creating. 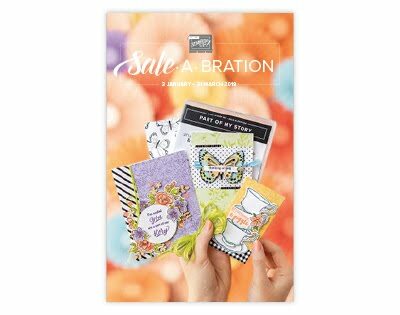 There are a lot of different product suites in these pages, but it wasn't hard to pick an inspiration point for me... the card on page 24 had me captivated the first time I saw it and sold me on the set. I love the Flurry of Wishes especially because the sentiments in the set are lovely and simple. I am not normally taken with snowflakes as they simply don't say Christmas when you live on the tropic of Capricorn like I do but this set is quite lovely, and the matching punch is fabulous. 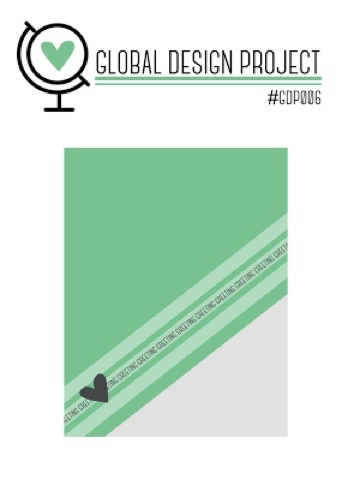 I think it looks a bit Celtic in the design so maybe it appeals to my Irish heritage! 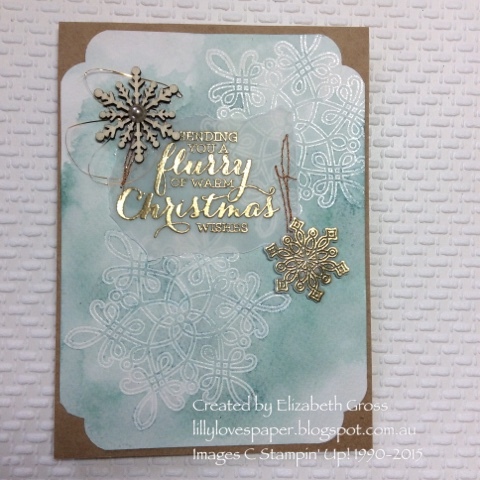 I heat embossed the largest snowflake onto The Watercolour paper using white embossing powder before doing a watercolour wash using Lost Lagoon and Soft Sky. 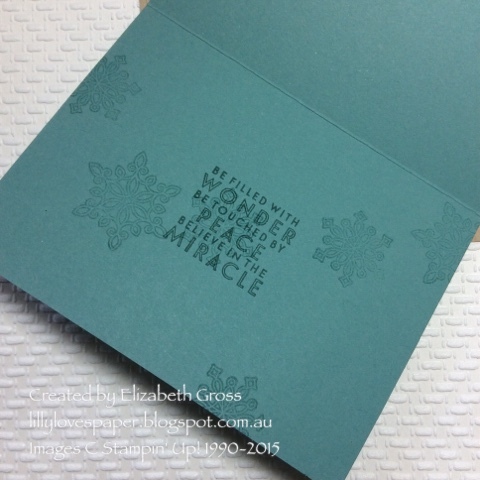 Then I embossed the sentiment and a few snowflakes on the vellum using gold powder - I love how luscious this looks! The panel was layered onto some kraft card and stitching helps hold the vellum piece in place. 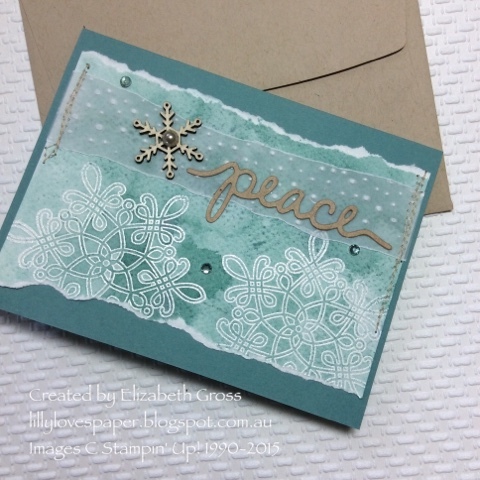 The timber Snowflake Elements are wonderful and a super quick way to dress up any card. The inside was decorated using a strip of the left over watercolour paper and a snowflake. Since I always do more than one page when watercoloring (trying in vain to minimise mess!) I thought I would quickly add the second panel to a Lost Lagoon card base for a different look. The strip of vellum was embossed using the Gently Falling embossing folder and the sentiment was cut from Crumb Cake card using the Christmas Greetings Thinlits Dies. 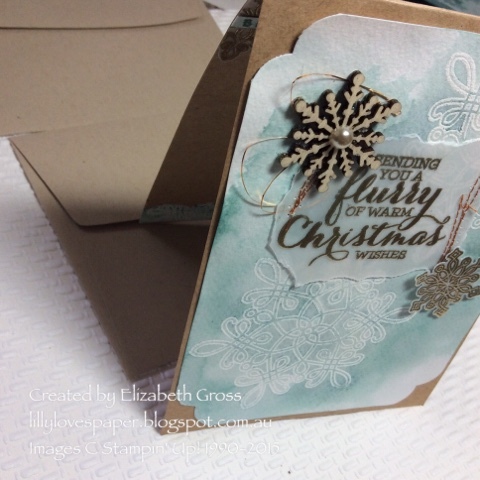 Again I used the timber snowflake and machine stitching to finish this card. 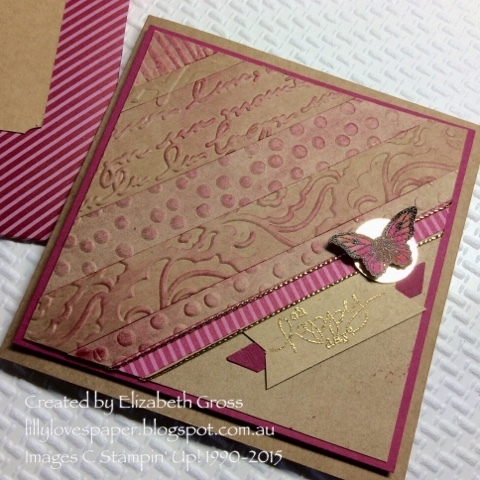 for this one I simply stamped with Versamark to give a watermark look on the inside. 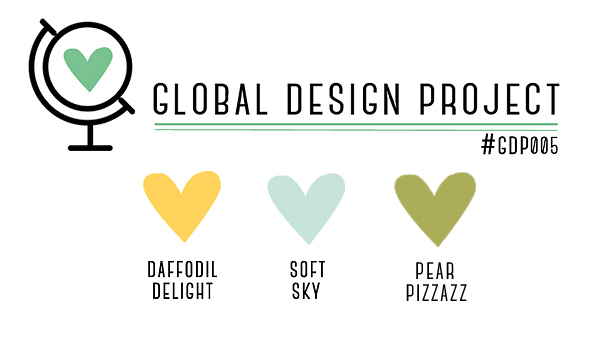 Thanks for looking, don't forget to check out all the other samples, next on the hop is Rebecca, I wonder what she has to inspire us with today? 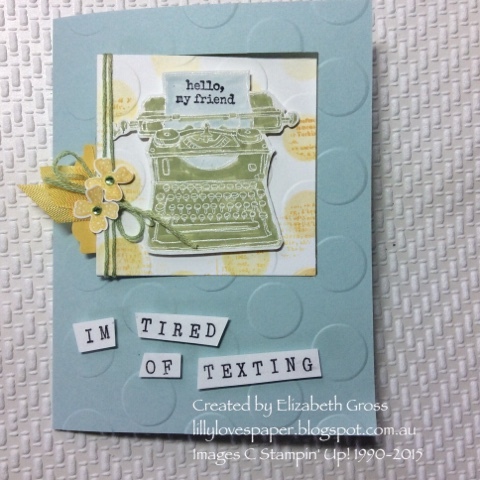 GDP#05 I'm tired of texting! 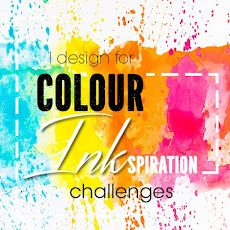 The colour challenge for this week is a beautiful soft combination and I am rushing to get finished before the deadline!!!! 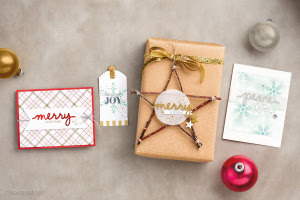 The rotary stamp makes it super easy to personalise your own message. 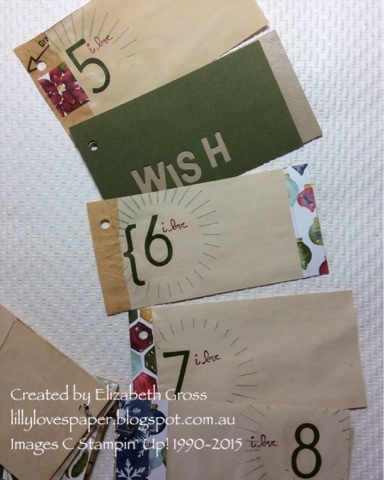 I loved the swing card on Julie Davison's blog and have wants to try it so today is the day! 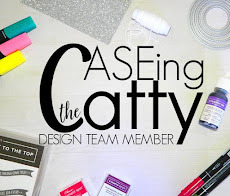 The CTC#50 blog this week is CASEing tags. 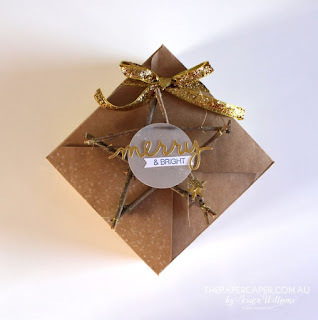 There are so many tags in the Christmas Catalogue and loads of gorgeous samples in the Bloghop I encourage you to have a look, you can find all the participants here. I was away and unable to join in last week but I have been so inspired by Jess's CASE that I have CASE'd her!!! So I thought I would have a go using some party straws I have lying around from last Christmas, and some red Perle Crochet cotton. 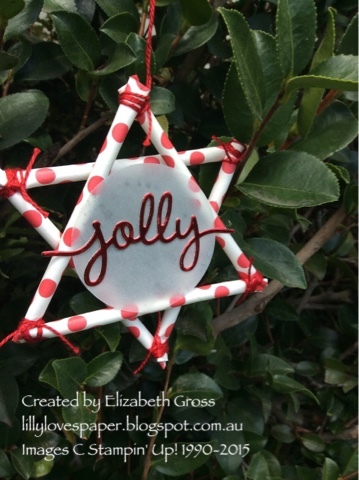 I love the rustic look with the twigs, but this is just a fun version with a nod to Jess. I do love the red foil on the vellum, and I think next time I would use longer pieces but this was done with just 3 straws cut in half.